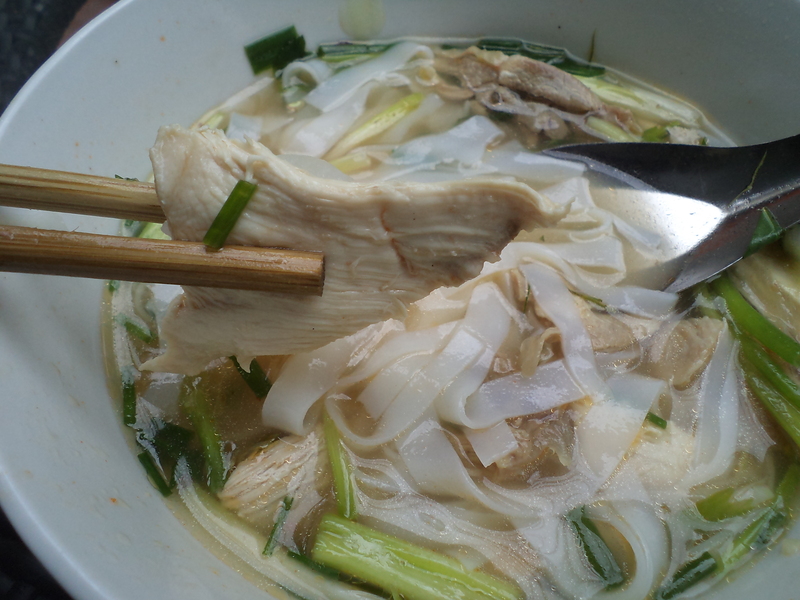 A while back a single piece of chicken hacked out of the carcass skin, bone and all was finally the straw that broke the camel’s back so to speak as I tried to in vain to enjoy a bowl of chicken noodle soup. 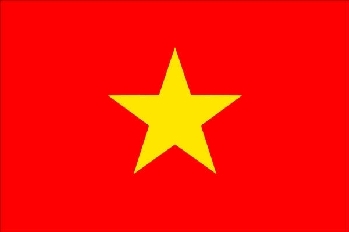 I vowed then and there it would be a cold day in hell before another spoonful of phở gà ever passed through my lips. I can report hell has indeed frozen over, and I have eaten what I vowed to never ever consume again under any circumstances. While walking around the Truc Bach Lake area of Hanoi together, my friend Allie wanted some breakfast but nothing of the truly local sort usually drawing me in. Right where Chau Long Street intersects with Pho Duc and Pho Ngu Xa we passed a café Allie described as “cute.” Even though I don’t usually eat at places falling into the “cute” category, I figured why not. We settled into adult size furniture at a real table out on the sidewalk under an awning. I must admit that not subjecting my quads to the rigorous workout caused by squatting on a tiny stool inches from motorbike traffic was actually quite nice. A steady stream of young office workers coming and going gave this place called Cat Café a vibe unlike any of the dingey phở parlors littering the neighborhood. Of course the only breakfast soup on offer happened to be the chicken stuff I so didain, yet I reluctantly ordered anyway knowing this would be my one and only shot for food in the near future. The waitress disappeared around the corner rather than back into the restaurant and then reappeared with two giant white porcelain bowls. I do not want to know where the soup came from and oh how I wanted to point out to Allie that even though she was sitting in her “cute” café the food was probably from some other joint’s cauldron bubbling away on the sidewalk with patrons hunched atop their 2 inch high stools. Much to my surprise this soup was good. The chicken was the requisite rubbery, chewy slices but surprisingly missing the skin and bones. I’ll take it! This is definitely progress to find all white meat without all the poultry accoutrement firmly superglued to it. 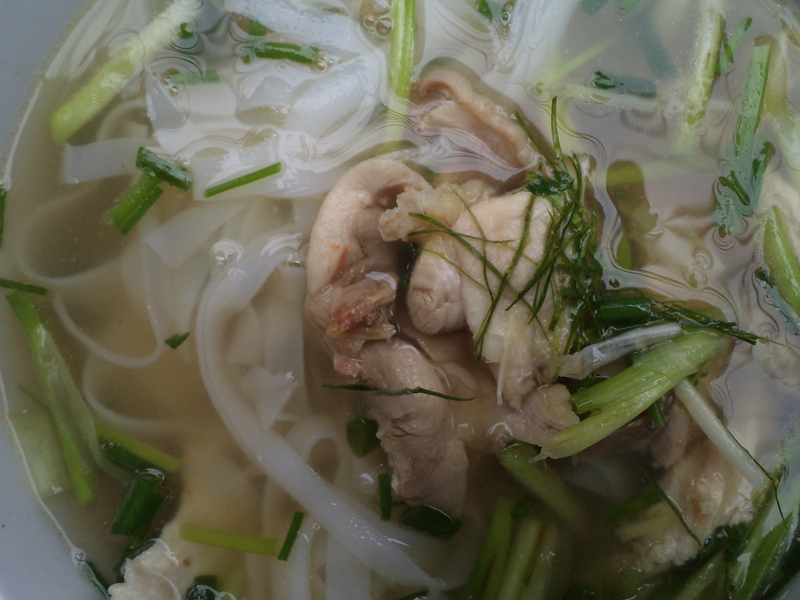 The broth tasted much like any chicken noodle soup in the US, and the rice noodles were silky soft. I finished the entire bowl, chicken chunks and all. Yes I ate a decent phở gà in a “cute” café. We just never know where the food journey will twist and turn in Hanoi.